Advances in surgical technology have produced a relatively new tool for accomplishing laparoscopic surgery using the daVinci ® Surgical System to perform laparoscopic procedures “robotically”. Robotic surgery involves inserting computerized surgical instruments and a camera through the laparoscopic ports. These instruments are attached to robotic arms that are controlled by the surgeon who is seated at a console in one corner of the operating room. Robotic surgery utilizes computerized surgical instruments which provides the surgeon a far greater degree of flexibility and precision than the standard hand-held laparoscopic instruments. Similar to standard laparoscopic/minimally invasive surgery, Robotic surgery uses small incisions, however with Robotic surgery the incisions are even smaller, allowing for quicker recovery. 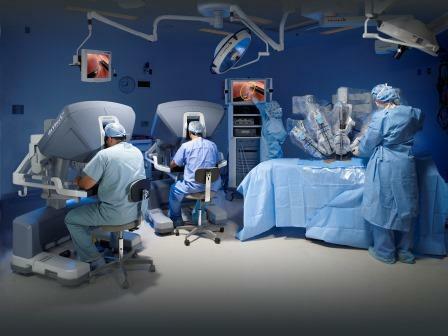 daVinci ® studies have shown that Robotic surgery reduces blood loss, and shortens length of hospital stay. Most patients who are candidates for laparoscopic surgery are candidates for Robotic surgery: Patients suffering from diverticular disease, colon polyps, colon cancer, Crohn’s disease and some with ulcerative colitis. Additionally, some patients with severe constipation who need a colectomy can have this done Robotically.